Dress up your child with this stylish and comfortable set that will give them utmost comfort during the sleeping hours. The round neck in pullover style of the t-shirt and soft elasticised waistband of the pyjama ensures easy dressing and a comfortable fit. 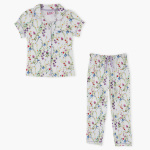 This is a must-have night apparel for your little one.